This dish was ultimately inspired by the Quinoa Taco Salad with I had at by Chloe last week. I just could not get it out of my head – the vegan chorizo, the fluffy quinoa, the creamy dressing. Oh, and the crunchiest of tortilla crisps to bring it all together. It was the KWEEN of salads, and I wanted it again, wanted it bad. Instead of lugging my lazy a*s there again, I figured I’d make it myself. Not necessarily the path of least resistance, but it did mean I could eat it in the comfort of my own home, sitting in comfy clothes and not having to face the cold. Too lazy to put on a jacket, but apparently not too lazy to fluff up quinoa. Go figure. Anyways, I was SO happy with the result. M even claimed this was even better than the one from by Chloe. HA! The OG from the restaurant used seitan for their vegan chorizo, but I decided to turn my attention to the humble sweet potato. Not only is it more accessible, it also makes this whole dish gluten free and hopefully more accessible for those who can’t necessarily find seitan where they live. completely meat free – hello vegan chorizo! Heat up the oil in a medium-to-large skillet, then add the red onion and sauté over medium heat for 2-3 minutes before adding the garlic, frequently stirring for another minute to avoid burning. Add the remaining ingredients, except balsamic and maple syrup, and continue cooking for 10 minutes and adding a splash of water when necessary. Once sweet potatoes are softened and cooked through, stir in balsamic and maple syrup and caramelise the sweet potatoes for a further minute or two before turning off the heat. Rinse and drain your quinoa (this helps remove the sometimes bitter taste) and set aside. In a medium saucepan, heat up the oil with the onion and garlic, sautéing together for 1-2 minutes for soften. Add in the rinsed quinoa to the pan and stir often until quinoa is dry. Add 2 cups of boiling water and the salt and cumin. Stir together and leave on a light simmer with a lid on. Quinoa is done when all the water is absorbed, 10-15 minutes. Turn off the heat and let sit for at least 5 minutes. Using a fork, fluff up the quinoa before adding the remainging ingredients and stirring everything together. Simply stir all the ingredients together with 2 tablespoons water until smooth and combined, adding more water if necessary. Taste and adjust any seasoning. 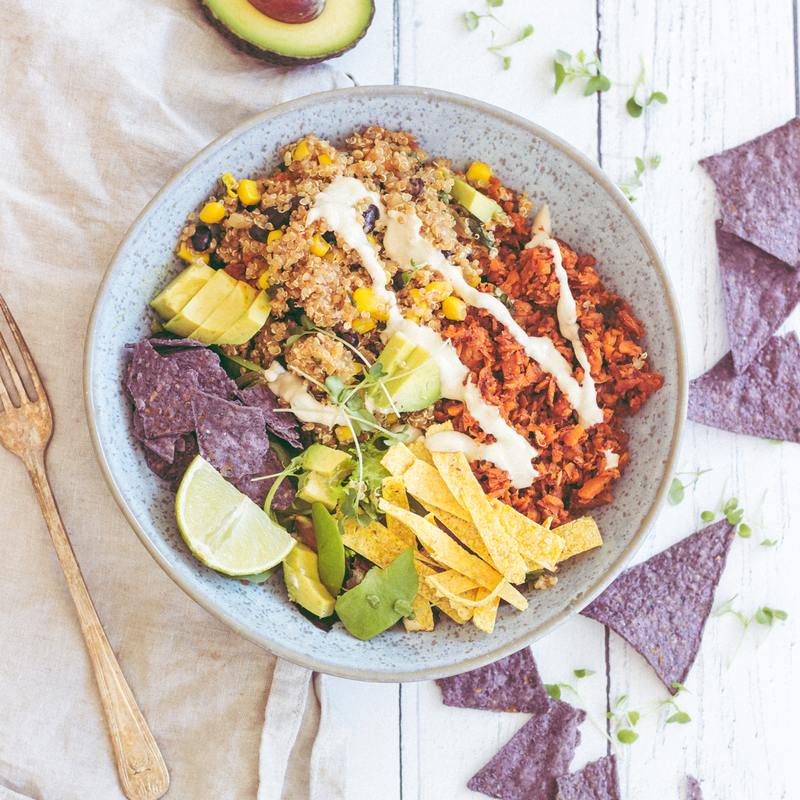 Add a layer of greens and top with the quinoa, vegan "chorizo", avocado, crunchy tortilla chips, and finally drizzle the creamy sauce aaaall over and enjoy! Hey Buddy!, I found this information for you: "Quinoa Taco Salad Bowl (With Vegan Chorizo!)". Here is the website link: https://www.sprinkleofgreen.com/quinoa-taco-salad-bowl-with-vegan-chorizo. Thank you.